← Have you ever lost interest in something you were writing? Okay… Here’s mine. This is 250 words of my YA Urban Fantasy: “Fire in the Woods”. Jess and David are running for their lives, so why not jump onto a speeding train? This is an awesome exercise, because reading this back, I just noticed I used “onslaught” twice in this segment. Yeas, I will change that. “Hold on,” David screamed into my ear. He turned toward the train, bracing himself. His feet left the ground and my stomach lurched as we rocketed through the air. My world became an onslaught of sound and throttling wind. I gritted my teeth against a scream building inside me, praying with all my might as we slammed against the side of the speeding train. I buried my head in David’s neck. Tears streamed from my eyes and flew through the air—never having the chance to dampen my cheeks as they ripped into the wake of the speeding train. David’s knuckles wrapped around a metal bar on the side of the door. We swung manically, bobbing up and down across the cold metal. My bones slammed against steel, skin and muscle unable to protect them from the tremulous onslaught of bodies banging against metal. “Hang on!” David growled as we jolted and swung, our bodies flailing away from the train before barreling back towards the rigid steel. I lifted my face, my skin burning and tearing from the wind’s merciless bite. I struggled to open my eyes against the wind pressure. David hung to the side of the locomotive with one hand while the other clutched my back. Another jolt sent us smashing back into the metal frame, David taking most of the blow. “Oh God!” I could do nothing but pray as my tear filled eyes struggled to focus. 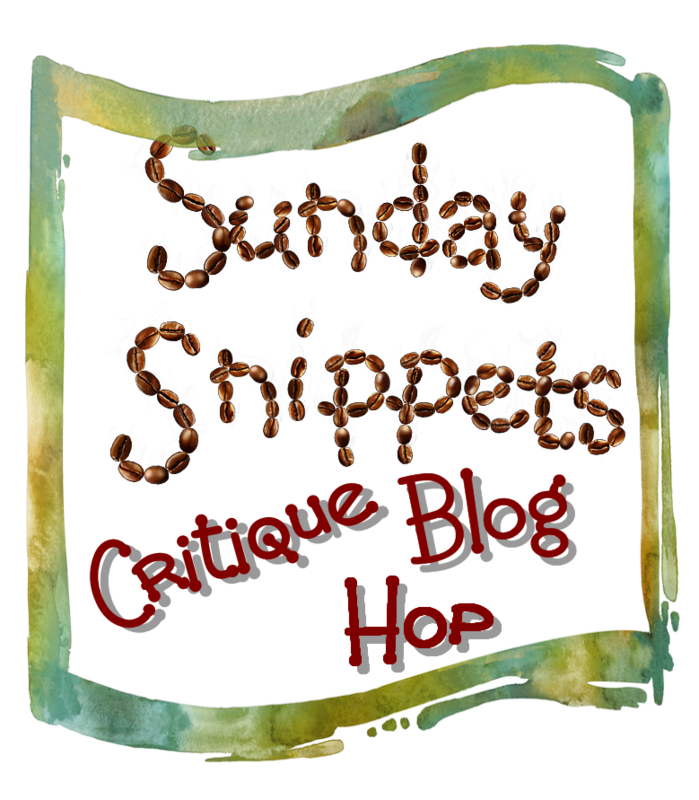 This entry was posted in Sunday Snippets and tagged critique, critique group, Lord, on line critique, Publishers, Sunday, Sunday Snippets Critique Blog Hop, Tools, Urban fantasy, woods, WordPress. Bookmark the permalink. I really felt as though I was “in the moment” with your characters here, and I’m definitely interested to find out more about why they are train-hopping. At first, I thought we were going to witness some sort of suicide-by-train-collision. The details are really great, and I didn’t see anything continuity-wise that hasn’t already been mentioned. I just wonder what could possibly be so worthwhile to risk jumping onto a moving train? Our main characters must have a strong friendship or relationship in order to trust one another that much! And I have to agree with you, examining these little chunks of text outside of the rest of their scenes is a fabulous exercise. So glad I got involved! Best of luck! What a nasty ride. One teeny comment: I can’t picture how they are hanging on. Are they not inside a car? How can David not only hold on but also support Jess if they are on the side of the car flying in the wind? I see their bodies slam but wonder if this is believable. Love the action. You sure know how to stir it UP! I really like the action of this piece, but there are a few things that seemed a bit off putting. The detail of her tears is really cool, but isn’t her face protected from the wind because she’s burrowed into David? “David’s knuckles wrapped around a metal bar” Knuckles bend, fingers wrap, I think. “My bones slammed against steel” and “my skin […] tearing” seem very violent to me. Like she’s coming out of this with broken bones, massive bruising, and multiple cuts. Good point on the tears. She tried to look up, but I didn’t say that. Yeah, they are getting banged up pretty bad. They are a mess when it’s over, but I probably need more “Pain” as well as the slamming. Thanks! I agree with Richard on his comments here…getting bashed onto the fuselage of the train would be very painful and dramatic – would bones break? Yes, I need to add the pain factor. Good point. Lots of action here, Jen! Jess’s fear shows. “Oh God. David, please don’t…” Just wondering if an emdash instead of the ellipsis would better emphasise a more abrupt cutoff. It might fit better with the overall pace. I’m not sure about two people hanging from the side of a speeding train would be “bobbing up and down”, especially “across” anything. That seemed a bit strange to me. Swinging back and forth, maybe. “David hung to the side…” Maybe you mean “hung on to” or “clung to”. Good pace, though. I like it!